After APEC ends, Peng Liyuan did not stop her steps, and recently she accompanied her husband attended the G20 summit meeting which was held in Australia. This time the trip, Peng Liyuan is also not forget China feelings, every detail is reveals Chinese flavor. The Heads of State gathered in Beijing after the APEC meeting, but those leaders was removed to Australia to begin a new round of G20 leaders summit. 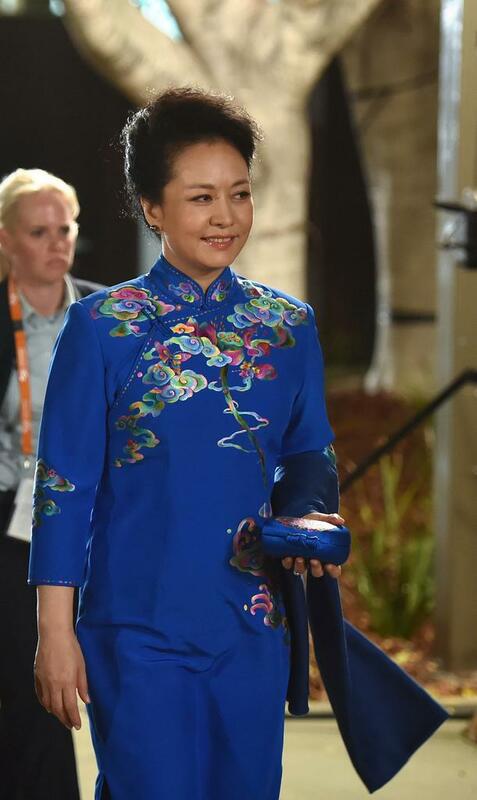 Peng Liyuan’s wonderful debut isduring in the APEC who has been the focus of media, she is always keep the “Chinese feelings,” the first lady of China Peng Liyuan is also share the Chinese Style into Australia. The local time 15th noon, the leader who attend the Australia G20 summit leaders held a barbecue lunch. 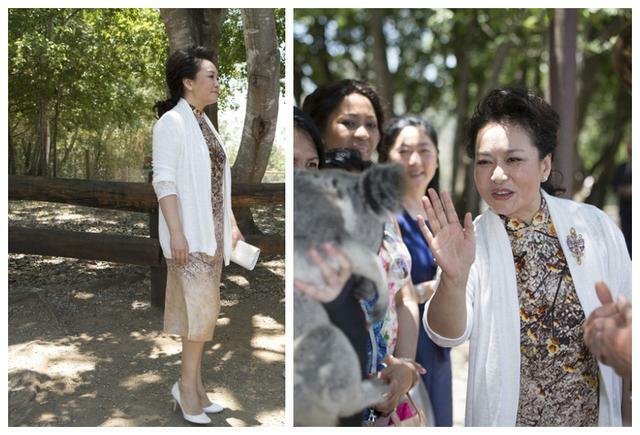 Peng Liyuan was gone to Australia to attend the G20 summit and embraced the Koala. Peng Liyuan chose a champagne Chinese cheongsam, cheongsam positive side with traditional Chinese ink outline front for decoration, with a white knit gown, the elegant needless to say. November 16, Mrs. The President Xi jinping’s wif Peng liyuan visit Brisbane gallery. 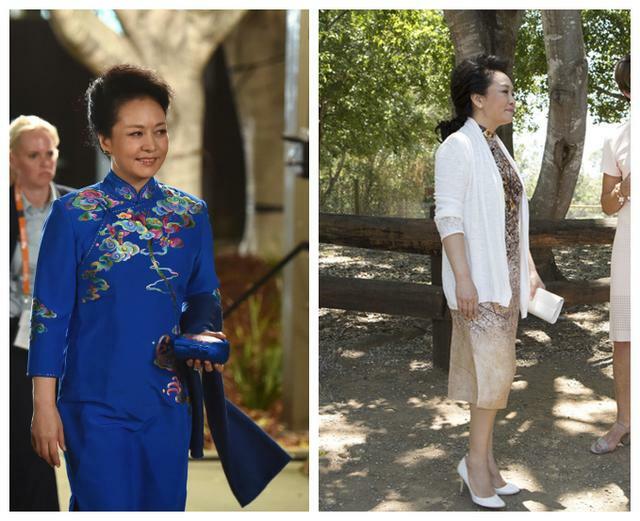 This time debut, Peng Liyuan chose improvement of Chinese costume, the collar of tops is cheongsam-style design, and the buttom is wear a traditional tight dress, to a more relaxed style, more portable and more reflects the practicality of the Chinese costume. The highlight of this dress in addition to the sapphire on the color for the innovation of the Chinese costume, the other point is the cloud patterns on the clothes reflect the Chinese culture. The clouds pattern was originally derived from the Chinese porcelain, and after being applied to the clothing, in the 2008 Beijing Olympic Games, the cloud patterns are adopted as clothing decorated athletes and visiting staff clothing decoration. 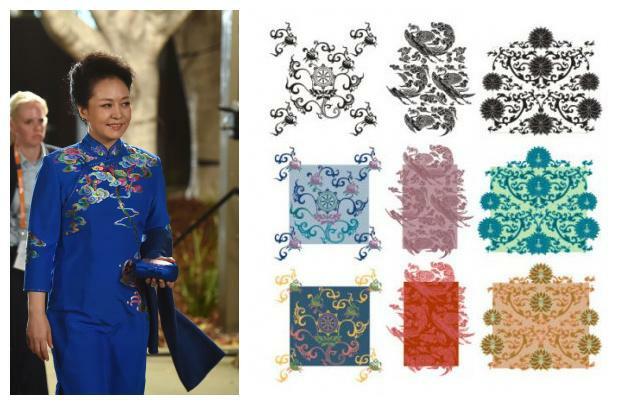 Peng Liyuan of this dress also adopted this patterns which is symbol of Chinese culture patterns, showing her feelings for China. This entry was posted in Fashion and tagged Peng Liyuan's dresses. Bookmark the permalink.